No, not me, but I wish. 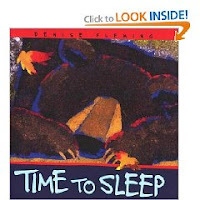 We actually started our hibernation discussions with this great book; "Time to Sleep," by Denise Fleming. I loved it. It helped the children see some other animals that hibernate--other than a bear--and gave small clues as to where. Even though it was giving facts, it was also a good story to read. Our craft was to make a bear hibernating in his cave. Last year I made a hibernating bear also, it was a bit different. This year I came up with a new idea, but I think I liked last year's craft better. The first part of this project was to paint the toilet paper roll brown. Two things with this step: 1) it is very messy; 2) they don't make toilet paper rolls like they used to. As the paint dried some of the toilet paper rolls actually started to come apart. I had about five that started to unravel. I was able to staple a couple back together, but I had one totally unravel and had to paint that child a new one. The bear is the second part of this step. Spread tacky all over one end of the tongue depressor. Place two large pom poms on the tacky. Then glue a small pom pom on for the bear's tail. I had cut "sleeping" eyes out of black paper and we glued them to the bear. Let everything dry and then slip the bear into his "cave." The tongue depressor is long enough so that the bear can slide in and out of his cave. Good luck! Awwww....that is so cute! I'll have to see if our library has that book! I love it! I do something similar for Groundhog Day. I'll have to remember this when I teach my hibernation unit next year!